Eric CRAVEN: Set. Mary Dullea (pno). Metier msv 28525 (1 CD) (http://www.divineartrecords.com/). 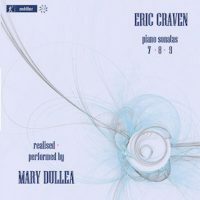 Eric CRAVEN: Piano Sonata No. 7; Piano Sonata No. 8; Piano Sonata No. 9. Mary Dullea (pno). Metier msv 28544 (2 CDs) (http://www.divineartrecords.com/). For the most part, performers follow composers’ instructions which are customarily detailed. 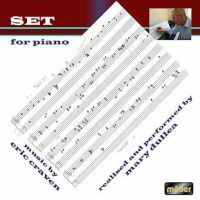 But sometimes, as is the case with Craven’s “non-prescriptive” music, the performer must add dynamics, durations and articulations, and even identify repetitions. These releases speak as much to Dullea’s interpretive craft as they do to Craven’s creative art. Set’s magic hides in how its 12 parts relate and contrast. Ingredients include hands in opposition or particular chords. Short motives may be glinting or didactic, as if from Bartók’s Mikrokosmos, while other ideas might be jazzy and incisive. A listener tries to make the obscure relationships explicit. Five’s descending notes suggest an infinite staircase, or the gravitas of Bach’s Crucifixus. Nine captures a rainy-day Satie-like dalliance. One through Eleven average just under four minutes; the shortest is less than a minute, the longest eight and a half. The concluding statement, Twelve, dwarfs all prior. Craven provides only pitches and permits repetitions, octave displacement, variable dynamics, etc. Familiarity with the prior 11 helps, as familiar shapes come in and out of focus. In Dullea’s realization, Twelve is 22:13, and a fitting culmination. No dates are given for these three Piano Sonatas, except for a hint that No. 8 post-dates Set. If Set could be considered a collection of etudes, then the Sonatas are more unified as befits their designations. The 20:45 Seventh presents five substantial movements in arch form. The outer movements offer perpetual motion thirds familiar from Set but here they suggest Ligeti’s Etudes. The second and fourth movements are apparently the same sheet music, but the design offers multiple interpretive routes. These are lighter, looser structures permitting inside sounds and treble arabesques. In Dullea’s shaping, No. 8 stands as a 48:46 mass. No. 9 is in three parts, just shy of 33 minutes. Like Set, the Sonatas grow more impressive and comfortable upon rehearings. 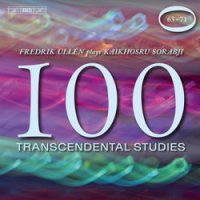 Kaikhosru SORABJI: 100 Transcendental Studies: Nos. 63-71 (1940-44). Fredrik Ullén (pno). BIS 1853 (1 CD) (http://www.bis.se/). Kaikhosru SORABJI: Var. comps. Michael HABERMANN: A la manière de Sorabji: ‘Au clair de la lune’ (1972). Michael Habermann (pno). Naxos 8.571363-65 (3 CDs) (http://www.naxos.com/). The British composer with the exotic name became notorious because he banned performances of his difficult music. Nothing sparks interest quite like that which is inaccessible, and Habermann and Ullén make this all seem easy. There are no overlaps in these collections. Despite admiring the technical difficulties that bloom all over, I confess that Sorabji’s music induces gentle nausea: Imagine Scriabin, Ives and Scelsi swirled indiscriminately. Tonality underpins impressionistic acrobatics. Traditional progressions are metamorphosed with cross-rhythms, superfluous chords and countless ornaments. The pieces seem improvisatory, even jazzy, like a drunken Berg with fantastic technique. Habermann’s collection reissues recordings made between 1979 and 1995, previously released on MusicMasters, Élan, etc., latterly reissued by British Music Society. Some tracks conclude with applause. The discs are titled, Early Works, Nocturnes and Assertive Works. The Early Works include pastiches and ruminations on others’ music. Fantaisie Espagnole and the Valse Fantaisie: Hommage à Johann Strauss drift equally across tango, Cole Porter and Irving Berlin. Disc two comprises three grand and evocative nocturnes. We get but a taste of the colossal Opus Clavicembalisticum with just the Introito and Preludio-Corale along with two colorful tone poems based on Montague Rhodes James’ ghost stories on the Assertive disc. A far more Romantic player than Habermann, Ullén intends to conquer all 100 Transcendental Studies. This is his fourth sequential installment, including premieres. Of this group of nine, No. 70, Rhythmes brisés at 4:08 stands out for its extreme arrhythmia and violence. A few studies are less than three minutes (Nos. 64, 65 and 68), but this tranche includes the large No. 63, En forme de Valse, No. 69, La punta d’organo, and No. 71, Aria. I eagerly look forward to the next releases. 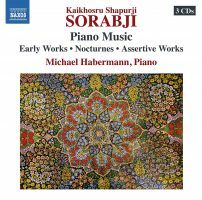 Ullén captivates and revels in Sorabji’s variety; Habermann’s tasks are just as difficult, but his repertoire requires a bit more effort. “Light.” Alexander SCRIABIN: 24 Preludes, Op. 11 (1888-96); 3 Pieces, Op. 2 (1887); Étude, Op. 8, No. 12 (1894). Karlheinz STOCKHAUSEN: Klavierstück XII, “Examination from ‘Thursday from Licht’” (1983). Vanessa Benelli Mosell (pno). Decca 481 2491 (1 CD) (http://www.deccaclassics.com/). Both Scriabin and Stockhausen could be filed under the category of mystic visionaries. 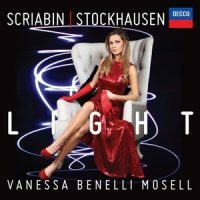 Scriabin more obviously so, whereas Stockhausen requires a bit more shoehorning, although folks might consequently be more sympathetic to his public and private theatrics. It does startle to encounter Stockhausen programmed after Scriabin, and even more so here as Mosell’s interpretations gravitate unexpectedly towards Gershwin’s relaxed classiness. The three-part through-composed Klavierstück XII requires virtuosity alongside Stockhausen’s particular declaimed counting, whistling and percussive doings. The piece rambles, and unlike the earlier ascetic Klavierstücke, there appears to be room for expression and even glamour, and thus a surprising affinity with Scriabin’s glittering “moments.” Once heard, I can’t unshake the unexpected flavors of Gershwin’s Concerto in F, or that there might actually be no difference between Scriabin and Stockhausen. Mosell has in fact worked directly with Stockhausen and can make the claim of authentic interpreter. 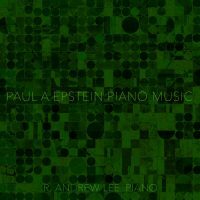 Paul A. EPSTEIN: Drawing No. 5, “triangles” (2011); Drawing No. 3, “Slow Title” (2010); Drawing No. 4, “triangles, broken horizontal and vertical lines, rectangles, and parallelograms” (2010); Changes 6 (2013); 72: 7/11/13 (2013); Changes 3: Palindromes (1977, rev. 2013); Landscape with Triads (2012); Drawing No. 6, “horizontal and vertical broken lines” (2011). R. Andrew Lee (pno). Irritable Hedgehog IHM016 (1 CD) (http://irritablehedgehog.com/). Across these pages we’ve encountered varieties of repetitive music which don’t easily adhere to the populist tenets of minimalism, composers such as Bernhard Lang, Alexandre Rabinovitch and Tom Johnson. Epstein should be folded into this list, even though his pitch collections drift towards serialism and notes may be placed according to complex rhythmic and mathematic functions. For example, 72: 7/11/13 opens with even motoring through white-key pitches, but gradually, following a hidden process, rests replace notes resulting in a stuttering klangfarbenmelodie. This music’s delight lies in the gradual distortion of something agreeable. Landscape with Triads appears to be a random (or obscurely defined) walk using common triads. Arrayed randomly they become disarming as experience and training condition us to hear relationships and implications. There’s not much Epstein recorded, which is shameful, and Lee’s program is admirable. Francis POULENC: Intermède (1952); Thème Varié (1951); Trois Mouvements Perpétuels (1918); Valse-improvisation sur le nom de BACH (1932); Fifteen Improvisations (1933-59); Badinage (1934); Mélancolie (1940); Trois Pièces (1918-28). Aleck Karis (pno). Bridge 9459 (1 CD) (http://www.bridgerecords.com/). It charms to know that Poulenc admired Webern, even though he felt no inclination towards dodecaphony. Karis reveals that both Poulenc and Webern could be concise and specific. We’ve heard Karis before in Webern and Feldman, and while Poulenc demands a different type of expression, Karis excels at unfussy material, and it benefits Poulenc to play leanly and let the surging traditional chord progressions and unexpected garnishes speak for themselves. The program’s range reflects Poulenc’s consistency, starting from a sparkling Neo-Classical style already evident in the early Three Pieces, a Pastorale, Hymne and Toccata. There are pieces which sound like Mozart or Rameau with bruised notes (Badinage, Valse-improvisation sur le nom de BACH, Hymne, Improvisation No. 8: “Modéré sans lenteur”) and those with tart soaring melodies (Thème Varié, Mélancolie, Improvisation No. 15: “Homage à Edith Piaf”). As a multi-decade collection, the Fifteen Improvisations engage with wit. 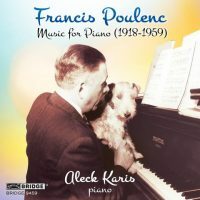 Much of Poulenc sounds like Satie, except written by someone who could actually play the piano. “Portraits & Tributes.” Scott WHEELER: Var. comps. (1977-2014). Donald Berman (pno). Bridge 9463 (1 CD) (http://www.bridgerecords.com/). 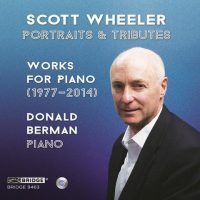 Taking a nod at Virgil Thomson’s similar practice, Wheeler’s portraits and tributes are written live as one might sketch from real life, except Wheeler works silently with pencil and music manuscript paper. Often a portrait will comprise a specific number of measures corresponding to its subject’s birthday or anniversary. Wheeler fluidly navigates in and out of tonality, sometimes referencing popular styles (Cliff Walk, Pseudo-Rag: GS, Calamity Rag) or abstract trends (Morningside). In Berman’s program, 26 of Wheeler’s effective miniatures surround a longer piece, Flow Chart. Commissioned by Berman, the 11:12 work borrows its title from a collection of John Ashbery poems, and is fairly representative as it reflects Wheeler’s admiration for Haydn and Bach, and also employs a distinctively American swagger. To better appreciate what Wheeler and Berman are offering here, it is best to explore a few at a time and admire their dissimilarities. Franz SCHUBERT: Impromptu, D. 899/4 (1827); Sonata in C minor, D. 958 (1828). Luisa Guembes-Buchanan (pno). Del Aguila DA 55312 (1 CD) (http://luisagbuchanan.com/). Two contrasting late Schubert pieces, perhaps representing public and private, extrovert and introvert. 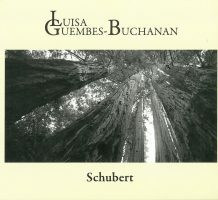 Guembes-Buchanan has an authoritative understanding of Schubert, gently leading us through the Sonata as if revealing it for the first time. More often than not, other Schubert performers make the late sonatas about themselves, as if these are Himalayan peaks requiring post-ascent storytelling. The C-minor Sonata is an expansive 30 minutes, wherein Schubert contemplates new trails, and Guembes-Buchanan shares its discoveries with us. Self-produced, recorded on a somewhat thick Fazioli which aptly suggests Biedermeier dust.